Following an intense judging day which saw the best talent within the plumbing and heating industry shortlisted to just 11 outstanding installers, the regional winners of the industry famous Heating Installer Awards have been revealed for 2019. These 11 regional winners will now go through to the final stage, which involves a peer-reviewed technical challenge and a public vote. The finalists scores for these combined with the judges scores will decide the national winner, who will be announced at Installer2019. Representatives from the awards sponsors – Danfoss, Geberit, Glow-worm, Polypipe and Stelrad – as well as the media partner Installer magazine, reviewed the entries on exceptional service, logical reasoning and positive outcomes, at the judging day which was held at Glow-worm’s HQ in Belper. The panel was also joined by previous Heating Installer Awards winners Shaun Scott, Peter Booth and Dennis Hollingworth. Each of the winners selected demonstrated a desire to go to great lengths in order to deliver incredible levels of service for their customers, using innovative solutions that improve the quality of life for people and businesses across the UK. Commenting on the awards, last year’s winner Shaun Scott said: “It was brilliant to be involved in the judging day and read about the fantastic work that is being done across the industry by so many talented installers. To show your support for the industry and vote for who you think deserves to be crowned the national winner of the Heating Installer Awards 2019, visit here where you can also find out more about all of the regional winners. Voting closes on 24th April 2019. Ever since winning the Heating Installer Awards last year, I’ve been looking forward to the prize from Danfoss. The time finally came on 9th October, when I boarded a plane to Aarhus in North Denmark. As soon as we landed we headed to Silkeborg to visit the Danfoss factory. At the factory we saw TRVs being produced and packed, ready to be distributed all around the world! It was great to see the manufacturing process – it was an interesting side to plumbing that I would never have imagined witnessing! After leaving the factory we travelled south for a night in Nordborg, home of Danfoss’ headquarters. 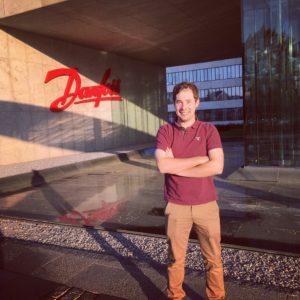 The next morning we got up early and went to the Danfoss headquarters, where we were treated to a historical tour of the Danfoss museum. The museum is the original farm house of Danfoss founder Mads Clausen, who founded the company in 1933, in an office above his mum and dad’s house. It was amazing to see the transition from a family home to the successful company Danfoss is today. We then headed to the Danfoss owned Science Park, which has been around for over 10 years helping to encourage children and young people to engage in science, technology and entrepreneurship. After some lovely food and drinks we made the last journey of the trip, south to Hamburg in Germany, before flying home. 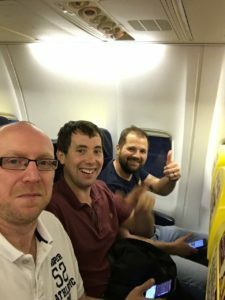 It was a fantastic trip, we were really well looked after and the whole experience was really incredible from start to finish. When you work with products every day, it’s really interesting to see what they do behind the scenes to manufacture and distribute them. It was a side to the industry I definitely wouldn’t have had the chance to learn about without the Heating Installer Awards. I’ll be disappointed to pass on my crown in May, but I’m excited for the next winner who gets to go on the trip! So if you want the chance to visit Denmark with Danfoss, make sure you enter the Heating Installer Awards. It was one of the highlights of my career so far and I have the awards and Danfoss to thank for that! At the Heating Installer Awards, we are committed to maintaining the trust and confidence of visitors to our website, subscribers to our e-newsletters and people who enter the awards. This notice explains how we use any data we collect about you, the limited conditions under which we may disclose it to others, and how we keep it secure. The Heating Installer Awards is an annual awards campaign run by Refresh Public Relations Limited (Company Number 7094330), trading as Refresh PR. Refresh PR is a public relations agency providing business to business and consumer PR consultancy services to organisations nationwide. Our registered office is Refresh PR C/O Lloyd Piggott, 2nd Floor, St George’s House, 56 Peter Street, Manchester, England, M2 3NQ. We obtain information about you when you use our website, for example, when you register an entry to the competition, vote or sign-up to receive our e-newsletters. When someone visits www.heatinginstallerawards.co.uk we use a third-party service, Google Analytics, to collect standard internet log information and details of visitor behaviour patterns. We do this to find out things such as the number of visitors to the various parts of the site. This information is processed in a way which does not identify individuals. We do not make, and do not allow Google to make, any attempt to uncover the identities of those visiting our website. As part of the registration process for our e-newsletter, we collect personal information. We use that information for a few reasons: to contact you if we need to obtain or provide additional information about your award entry; to keep you updated about the awards; to check our records are correct; and to check that you’re happy and satisfied every now and then. We use a third-party provider, MailChimp, to deliver our e-newsletter. We gather statistics around email open rates and clicks using industry standard technologies to help us monitor and improve our e-newsletter. For more information, please see MailChimp’s privacy notice. You can unsubscribe to general mailings at any time of the day or night by clicking the unsubscribe link at the bottom of any of our emails, or by emailing unsubscribe@refreshpr.co.uk. We anonymise your entry when it is presented to the award’s judging panel. The only information shared with the judging panel is your gas safety number and membership of any trade bodies. We do not share any other personal information with the award’s sponsors or any other businesses or organisations. You can unsubscribe to general mailings at any time of the day or night by clicking the unsubscribe link at the bottom of any of our emails or by emailing unsubscribe@refreshpr.co.uk. We are committed to ensuring that your information is secure. In order to prevent unauthorised access or disclosure, we have put in place suitable physical, electronic and managerial procedures to safeguard and secure the information we protect online. You are entitled to view, amend, or delete the personal information that we hold. Email your request to unsubscribe@refreshpr.co.uk. We keep our privacy notice under regular review and any updates are posted on this website. The notice was last updated on 16 May 2018. Any questions regarding this notice or our privacy practices should be sent by email to info@refreshpr.co.uk or by writing to Refresh PR, 3E Tariff Street, Manchester, M1 2FF. Alternatively, you can telephone 0161 871 1188. A new report from the European Building Automation Controls Association (eu.bac) shows that energy costs for millions of households across the EU (including the UK) could be reduced significantly by upgrading heating systems with basic thermostatic radiator valves (TRV). Heating controls manufacturer, Danfoss, believes the new report provides compelling evidence for installing TRVs as an upgrade for existing heating systems as well as in new build properties. Eu.bac prepared a detailed country-by-country analysis based on data from the European Environment Agency on energy use and heating costs in EU homes. The study estimates that about 500 million uncontrolled valves are still mounted on radiators in homes across the EU, wasting energy and money year after year. An uncontrolled radiator valve runs non-stop, even when the room has become warm. A TRV can be set to heat a room to the required setting. Once the room temperature reaches that setting, the valve turns the radiator off. When the room temperature drops again, the TRV turns the radiator back on. “Fitting this kind of thermostatic radiator control means homes can be kept comfortably – and affordably – warm,” explains Gareth Ash, Marketing and Technical Manager at Danfoss. The study concludes that EU citizens would save a staggering €12 billion annually and reduce CO2 emissions by about 24 million tonnes if all of the 500 million radiators with uncontrolled valves in the EU were upgraded with TRVs. The estimate is based on an average energy saving of 18 % when installing a TRV, a conservative figure that could turn out to be significantly higher. The eu.bac study found that the typical cost of installing TRVs would be paid pack in energy savings in just two years. 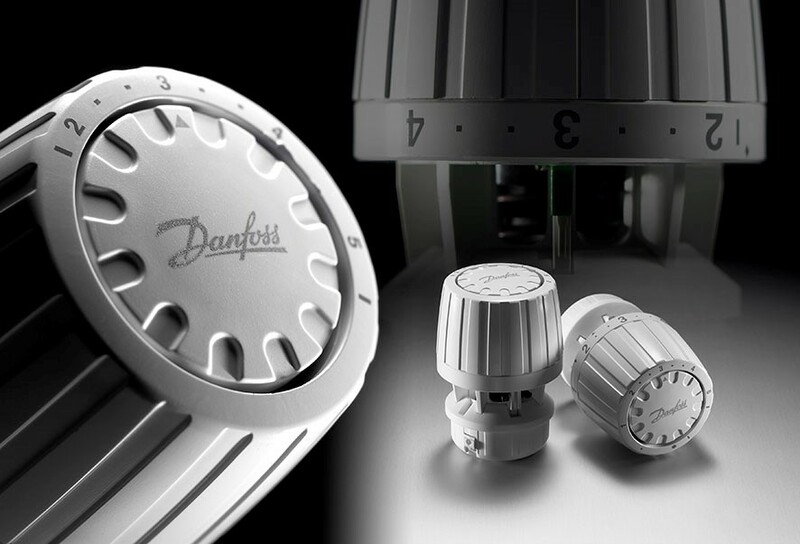 “And if you compare this to the 20 year minimum lifetime of a high quality Danfoss TRV, for example, the potential savings once installed are huge,” claims Gareth Ash. The Heating Installer Awards looks to recognise the achievement of plumbers and installers who deliver excellent customer service on a daily basis. So if this sounds like you, why wouldn’t it be a great idea to enter? Everyone deserves to be acknowledged for the great work they do within the industry. 1. Awareness – By taking part in the awards, your business will be recognised for its excellent work. We want to help promote those who go above and beyond for their customers every day, and help you secure more business in the process, so we use Twitter and your local press to do so! The awards will help you stand out from the crowd. 2. Acknowledgment – Everybody wants to feel acknowledged for the work they do. The HIA can help those who are nominated to feel proud of what they deliver every day. Moreover if you know an installer that deserves some praise, you can always nominate them. 3. Recognition – Being recognised for the work you do immediately helps increase your confidence and self-belief, which is why we also encourage your customers to enter on your behalf. We want all installers who produce excellent work for their customers to be confident in the work they do, and we know you don’t always have the time to fill in entry forms. So let the customers know it’s happening, and you might just get a nice surprise! 4. Marketing – Regional winners of the award receive a tailored marketing plan that will not only help secure votes to see you crowned regional and national winner of the awards, but will help promote your business to the public too. Just another way of us helping you make more money! 5. Community – One aim of the Heating Installer Awards is to bring together the installer family, and help develop a sense of community amongst installers. Whether it be chatting on Twitter, or encouraging installers to nominate one another for the awards, we’re always there to offer a helping hand. Remember, entries for this year’s awards are only open until the end of February. Get nominating!